Powered by MetalForming magazine, with support by the Society of Tribologists and Lubrication Engineers, Tower Metalworking Fluids, Industrial Innovations, Fortech Products, Unist and Fuchs Lubricants, the inaugural Lubrication Technology for Metalformers conference promises to be a content-rich event. Attendees will gain important updates on new lubricants for stamping, and tool and die machining; insights on how to evaluate new formulations and select the right lubricant for the job; and details on techniques for applying lubricant to ensure optimum application while minimizing waste. 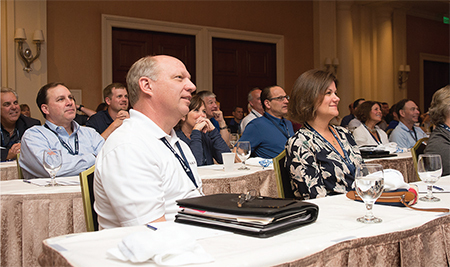 From the first-day keynote on considerations for selection, use and disposal of lubricants to the second-day final session on parts-cleaning fundamentals, more than a dozen detailed sessions provide a wealth of practical information along with plenty of networking opportunities. Tuesday, February 12: 8:30 a.m. – 5:30 p.m.
Wednesday, February 13: 7:30 a.m. – 12:15 p.m.
Metalworking fluids are a complex mixture of chemicals that directly impact employees, part quality, machine performance, and compliance with environmental, health and safety regulations. This presentation discusses what manufacturing facilities must consider in order to achieve the highest overall production rates at the lowest part cost. Appropriate selection of test methods and testing conditions is necessary for the reliable evaluation of lubricants, with test parameters simulating real production conditions where the lubricant is used. This study discusses the use of a practical test method—the cup-drawing test—for evaluation of stamping lubricants. This presentation categorizes and describes available tribotest methods and a system for selecting appropriate tribotests for metalforming operations. Many of today’s newer substrates found in steels, stainless alloys, advanced ultra-high-strength steels and aluminum alloys require different lubricant considerations. Determining which lubricant to use requires a full review of the variables to help determine the best product for the process. This presentation reviews a proven methodology for selecting the right metalforming lubricant based on the substrate. The use of lighter-weight metals plays an important role in the automotive industry’s strategy to improve fuel efficiency and passenger safety in vehicles. This presentation discusses some of the effects these metals have on stampings, and lubricant technologies that can help. This presentation discusses conservation during the lubricant-application process, as well as reclaiming, processing and reusing waste oil to gain a financial advantage. Other topics to be addressed include regulatory hurdles, and being "green" by avoiding the introduction of waste oils into the environment. Nate Moore, Maintenance and Facilities Manager, Talan Products Inc. This presentation addresses global regulations such as the Global Harmonized Standard (GHS) and regional regulations such as California's Proposition 65 and the SCAQMD's VOC directive. North American regulations affecting the use of specific metalworking-fluid additives such as chlorinated paraffins also will be reviewed. Proper lubrication often is overlooked as a contributor to lowering costs, improving quality and achieving higher throughput. Yet, a proper lubrication-management solution can yield significant savings. This presentation illustrates how inconsistency in lubrication mixing and application can adversely affect operations and also illustrates the benefits of precise, accurate and controllable lubrication delivery and application. Case histories detailing improvements at companies that have transitioned from manual to automated systems will be presented. This presentation focuses on the use of lubrication in various metalforming processes, discussing both the importance of lubricant and why it can be a costly item to overlook. From fluid selection to the way it is applied, there’s great room for improvement. Two metalforming case studies will be reviewed and discussed. Mark Cooper, Director of International Sales, and Kyle Billin, Regional Sales Manager, Unist, Inc. This presentation focuses on machining coolants used to manufacture dies and tool sets. Die manufacturing involves machining hard alloys that present unique challenges. The lubrication chemistry behind selecting the proper metalworking fluids for difficult-to-machine high-hardness and high-nickel alloys will be covered, as will environmental and workplace concerns related to grinding carbide, EDM fluids and rust preventives for die storage. 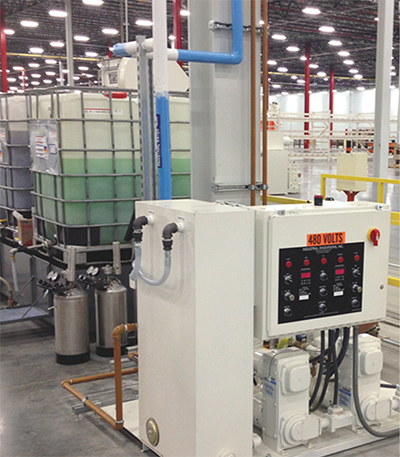 Selecting the right solvent technology and equipment remains more challenging than ever. This talk addresses best practices for selection, while contrasting the benefits and unique characteristics of the many options available to manufacturing operations that prefer solvent cleaning. Also on the agenda: performance and EH&S requirements. This presentation discusses various mechanical and chemical cleaning technologies, enabling managers to make intelligent decisions in the selection, design, installation and upgrade of cleaning systems. Topics include soils, substrates, cleaners, rinsing and drying, and the means to verify cleaning and rinsing effectiveness, as well as process automation, safety, troubleshooting and preventive maintenance of process equipment. See also: Chemetall US, Inc., FUCHS Lubricants Co., Houghton International Inc., Industrial Innovations, Inc., KYZEN Corporation, Tower Metalworking Fluids, Unist, Inc., Chemical Solutions, Dubois Chemicals, Inc.
How much is the registration cost? I tried using the link listed above but got errors. Thanks, Anoop.